Ideal Industries Barrier strip withstands current rating of 20-Amps at 300-Volts and 10-Amps at 400-Volts. It accommodates wire size of 22 - 12-AWG. 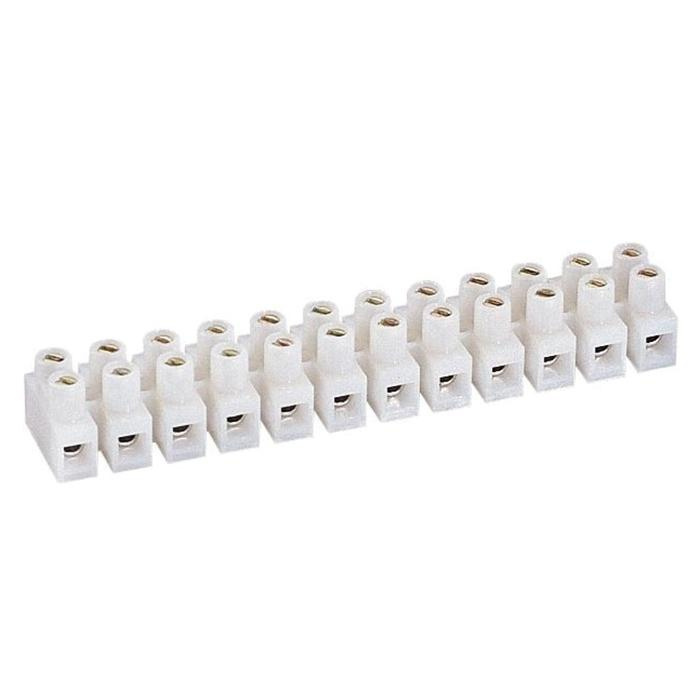 This 12-terminal strip has rugged nylon construction. It has rugged base that eliminates breakage. It has recessed screws and tubular contacts, which provides added safety and help prevent short-circuits. Strip withstands operating temperature rating of 105 deg C. It measures 3.78-Inch x 0.66-Inch x 0.57-Inch. It has flammability rating of 94 V2 to withstand harsh environment conditions. Barrier strip is UL listed, CSA certified and RoHS compliant.